An interesting and diverse roster of sampled analogue curios that operate well and sound (mostly) gorgeous. Broad sound set. Philicorda and SH-2000 particularly good. Excellent multieffects. Well-implemented Omnichord design. Edgy Korg Mini 700 sounds. We'd like to see more presets. CPU hit when adjusting parameters. A few glitches. Sampling sartorialist Sonic Couture produces a broad range of high-quality sample packs in various categories. This latest 'Vintage' one comprises ten unusual multisampled analogue instruments for Kontakt 5 and Kontakt Player 5, and it weighs in at 7.8GB. 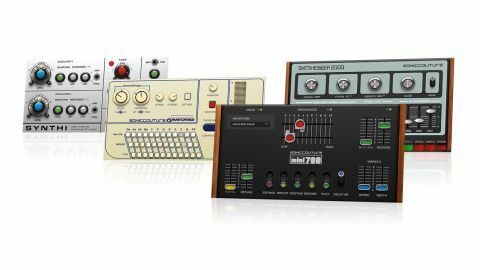 "Each instrument is the subject of its own bespoke Kontakt instrument, and there are 350 categorised presets in total"
There are four synths: the Korg Mini 700, Roland SH-2000, Korg LP-10 and EMS Synthi AKS. The strings are covered by two instruments: the RS-202 String Machine and Godwin String Concert 249, while the two organs comprise the Hammond Solovox and Jennings Univox. Rounding things off are the Suzuki Omnichord and Philips Philicorda. A motley crew indeed! Each is the subject of its own bespoke Kontakt instrument, and there are 350 categorised presets in total. Every instrument also includes the same standardised multieffects page and an 'initialise' preset (with effects bypassed). Some are sampled with filtering in place, to recreate precisely the sonics of the originals, whereas others sample rawer sounds, with filtering applied in Kontakt to allow for greater control, smoother sweeping, resonance adjustment, etc. The SH-2000 is the only instrument that doesn't feature a polyphonic mode; but it does include the 30 presets of the original (it's the only instrument here that had any). These can be enhanced with a click of the WOW switch, which kicks in a brighter, more sharply filtered version of each. Rounding the SH-2000 off are MIDI controllable Growl (FM amount), Filter cutoff and Vibrato. This Roland classic makes some great sounds, including particularly solid basses. The portamento is a bit glitchy, though. Next, the Korg Mini 700, a single-oscillator synth offering five basic waveforms. The twin- slider LP/HP filter is excellent, and Sonic Couture have also included 27 'tweaked' raw waveforms; our one criticism is the high CPU hit. The EMS Synthi AKS is emulated in three instruments: one dedicated to the sort of one- shot FX the original is famous for, another for playing a library of loops created using its sequencer, and the third upscaling the original into a polyphonic twin-oscillator instrument. The Korg LP-10 is the weakest synth here, although its three source sounds (E Piano, Piano and Clav) can make quite haunting sounds. The two string machines are very different to each other, the Godwin's three sources (Cello, Viola and Violin) delivering rich chorused tones, and the RS-202 Strings being quite brittle- sounding, partly down to its harsh filter. Both organ instruments are crude but can produce piercing Telstar-style tones with ease. Using the Univox and Solovox in polyphonic mode can also elicit nice, thick pad textures, while the vibrato keeps things suitably eerie. The Philicorda uses five selectable voices to generate rich low tones and higher bell-like ones, but its party piece is the Chords option. This switches the lowest 17 notes to play a bank of preset chords, which sound great. Finally, the Omnichord recreation is superb, with its renowned chord mode made available via chord selectors and strummer, as well as keyboard and mod wheel. The Attic's ten highly characterful instruments cover a lot of unusual sonic ground very successfully. The only 'global' issue we have is that the categorised presets are only grouped by sound type, not by original instrument.